▶ 30 Yard Dumpster Rentals | Best Prices In Miami, Fl GUARANTEED! 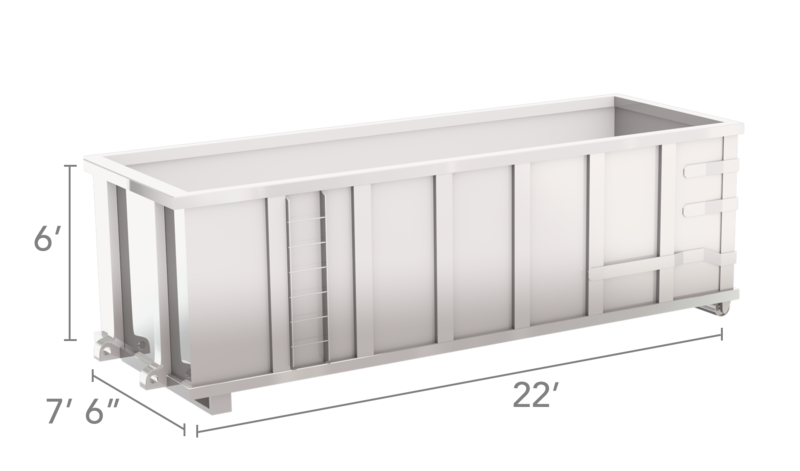 Dimensions: 30-cubic yard dumpsters typically measure 22 feet x 8 feet x 5.25 feet. Capacity: This size can carry the equivalent of approximately 12 pickup truck loads. Weight Limit: A 30-yard dumpster can typically hold 7,000 to 10,000 pounds. Please note: weight limits vary by location. Call us for details. Other Key Features: The higher walls on the 30-yard dumpster make it a good choice for holding furniture and other bulky items. Moving out of one home and into another home. Need A 30 Yard Dumpster? Pro Tip: When comparing dumpster services, ask about what’s included in the quoted price. We provide an all-inclusive price, but other companies may quote you a base rate and then charge you per ton for disposal at the landfill. About 50 feet of space length-wise is needed to drop off a 30-yard dumpster. Make certain there are not any type of vehicles or other various objects obstructing your driveway or lot. 18 feet of vertical space is needed to elevate the dumpster off the truck and effectively place it on the ground. Please be sure that there are not any low-hanging wires or tree branches above your drop spot. We will do our absolute best to get your dumpster positioned in a preferred location, if it can be done safely. Please communicate any type of problems ahead of time. Please call ahead just incase we would need to request a permit for us to be sure to have it on site before the roll-off is delivered. While the measurements of a 30-yard dumpster are large, it cannot hold an unlimited quantity of debris. Constantly keep the weight restriction in mind as you pack your dumpster. If you are not exactly sure whether a 10-yard dumpster is the best deal for you, do not stress – we also provide 10-yard dumpsters for small tasks and 20-yard dumpsters for mid-level jobs. Give us a phone call at 305-691-1516 and our team will assist you with determining exactly what size best matches your project. If you have already figured out that this is the size you require, a fast telephone call is all it takes to place an order! Miami is the place to be for pristine beaches, shopping and nighttime excitement. Just ask any of its almost half million citizens or thousands of tourists passing through. With Miami’s business sector being one of the fastest growing in the United States, the surrounding suburban areas have also grown quite a bit. New construction and updated renovations of commercial and residential structures have created a much higher need for affordable dumpster rentals in Miami- and dumpstersrentalmiami.com is proud to offer it. From small private businesses and homeowners to the towering apartment buildings and hotels downtown; contractors and property owners require fast and efficient job site clean-up with dumpster rentals they can rely on. Our Miami dumpster service is licensed to work within Miami city limits and surrounding areas – enabling us to assist landlords, business owners, construction companies and homeowners keep their projects on schedule, safe and within the county.